The tear of psychoanalysis is produced by Felix Guattari and Gilles Deleuze. They call it schizoanalysis, territory of wolves, desiring machines that transform the identity of cogito ego into a future (it) schizo. Clinic praxis. Radical mise-en-scene in which nobody remains exempted from effective offence, the spatial hierarchies become anarchic and speech no longer figures out the metric of a structured unconscious. When this happens, the gift of happening “language is stretched to its limits, towards music and silence”. Schizoanalysis is a thought of immanence, over-the-top production of the real and no longer the oedipal triangulation of an expressive unconscious. Speed transforms the point in line and the divan becomes the tool box, direct entry in the body of the real. The abstract machine of schizoanalysis thus becomes an operator of distinctive synthesis, populating with intensities the flesh regained. Cases of thoughts. Cases of initiations of abstract blood. Scaffold of escape lines in immediate connection with the outside. The outside of the inside, cross-cutting rhizomatic paradoxes that inhabit the desertic zones of desire. That no place or place created neither above nor beneath but on the wind surface which offers its hospitality.Text written in 1992. That no place or place created neither above nor beneath but on the wind surface which offers its hospitality. Become the tightrope over an abyss that makes us shiver. In the performer there is no centre that operates as authority, practices are in the centre. The idea is to substract what shuts off the difference or freezing point through identification and recognition on a same object which is identical. The performing practice inserts enigmas, lines of errancy in motor control, lines of temporary setting made up of flows and initiations. The art of performance does not isolate or fasten, it determines practices of self-legitimization, self-care, self-analysis, autopoiesis, self-authorisation starting from sensations that germinate at the crossroads and make connections. What is to anticipate? A poem? A medicine? A performance? What is an enigma? An image? A block of difference? A force providing hospitality? A will of power? It is enlightment that predisposes the performer, willpower that enables to be affected in many ways. Availability of a complement, which is internal, an internal/external desire, an available affective balance. Dance of fluids, pro-active dance that summons the irruption of allies-monsters. Thoughts that move in bifurcated times like schizia flash and non-significant. Bodies that include enigmas, bodies connected, folded, symbiotic like the effect of force relationships that make us feel, become sensitive. How is it possible to break in or make a line of rupture emerge, a small broken line that provokes the wayout in black alleys? The game consists in setting dreams. Lines that determine a body choreography of our dreams, acted as part of reality instead of being told or interpreted. Writing with the body, avoiding the repetition of everything that makes the body docile and submissive. That is why art makes it possible for our body to withstand limitations and flows. And expand, reverse, turn the mutation device. Ceremony of body rituals that allow no performance, continuing emotional lines that allow improvisations. Choreographic lines capable of redefining a social body beyond its disciplinary anatomy, beyond its territories of power, beyond discipline and control. Poeticize is an activity of simulation. Activity that anticipates what is yet not possessed. It is something that we cannot describe or know, that we have never seen or dreamt of but we feel vibrate all over the body, from the toenail to the head hair. The medicinal value is that it can change direction. Sadness can turn into singing or poetry. Something that cannot be interpreted but may enable to listen the voice of the own myth. Looking for the own way of moving in the dark, not visually, listening in ceremonies of self-healing. It houses what is virtual, mythical, tribal, primitive. Something that cannot be interpreted but may enable to listen to the voice of the own myth. Always more, always less, at the same time, yet never the same. A new life is recovered, reorganized. that gets into my skull. are recognized by the sound made with softness. I hear the sound of transformation with imperceptible small ears. 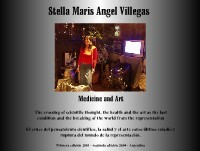 Stella Angel Villegas, born in Rosario, is a Schizoanalyst and Plastic Artist who does research and generates poetic connections between thinking and artistic creation as practices for life, a philosophic-poetic proposal to create health. She founded in 1992 and runs the Centre for Studies and Research on Medicine and Art, institution which provides further insight into the problems of the XXI century, cross thinking and transdisciplinary aesthetics. She is a pioneer in the Virtual Forum and Sessions for Schizoanalysis. She is Professor and Consultant on Philosophy.She conducts seminars-workshops and conferences on the thought of Gilles Deleuze and Felix Guattari in Argentina, Cuba and Lisbon, Portugal. The films and images correspond to installations, choreographies and artistic-clinical research work on schizoanalysis. They belong to original documents on installations and performance. Centre for Studies and Research on Schizoanalysis. Medicine and Art. 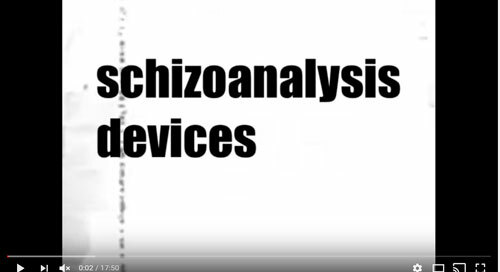 Training, production and exercises on schizoanalysis. Poetic fractals of the graphic exhibits.